Previous posts have followed the fortunes of the Commonwealth Bank. This is a follow-up post based on technical analysis, and should not be considered as constituting investment advice. Observations are based on a Daily Chart over the past year. It should be noted that chart patterns may be suggestive of future share-price movement, but it is only in retrospect that one can verify their significance. The year started by testing support at about $73.50 after encountering resistance at an all-time high of $80. In May it transitioned into a sideways trading range pattern with most of the price action between $81 and $82.25. During this period the price spiked higher to a new all-time high of $83.92, before easing back. 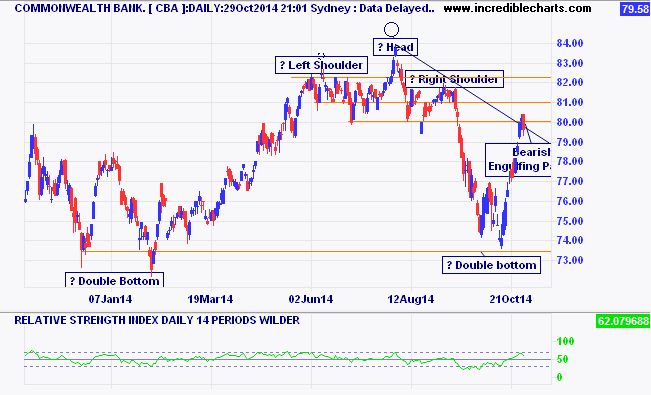 In doing this a chart appearance suggestive of a head and shoulder pattern was formed. This proved to be predictive of a corrective move lower which wiped off all the previous gain. The impulsive move higher has been a strong one with overnight gapping to reach and test resistance again at $80. The trend line has been penetrated but not convincingly. Today’s price decline formed a bearish engulfing pattern suggesting reversion into a corrective phase. This would bring back concerns for lower prices instead of further gains, with a lower high than the previous one.